Sew Festive Handmade: Productive week! I really buckled down this past weekend and I'm SO glad I did. It felt really good to sew for a while! What did I accomplish, you might ask? 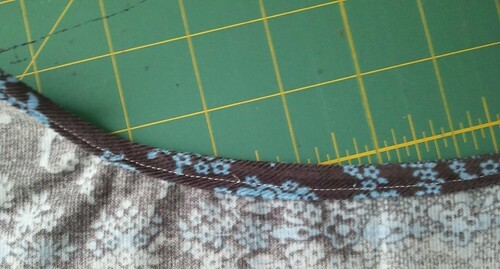 There was the Schoolhouse Tunic sewing in order to keep ahead of the sew-along. And I finally got pictures up! There's only like 3 missing, but I'm getting those last ones up after this post goes live. Apologies again for all the problems this week! I'm finding that the fit is different with the Amy Butler corduroy that I'm using, so I had to go back and re-sew the shoulder seams and sleeves to accommodate the fact that the seams are bulkier with that fabric. I love to re-sew things, said no one ever. 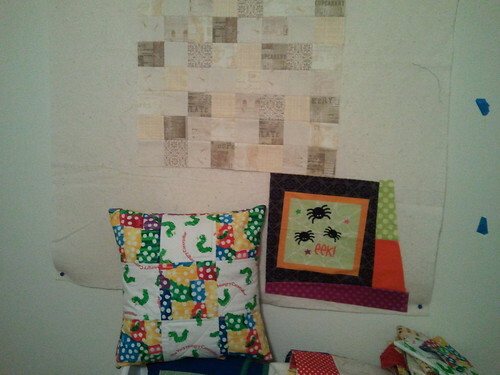 I made a simple envelope closure for the Hungry Caterpillar pillow and found a new pillow form for it just living in my sewing room closet [hello serendipity]. That goes in the commissioned items pile! One item marked off my 100 Day Hustle list! You can also see the absolute beginning of my pillow that I am determined will be on my couch for Halloween this year. 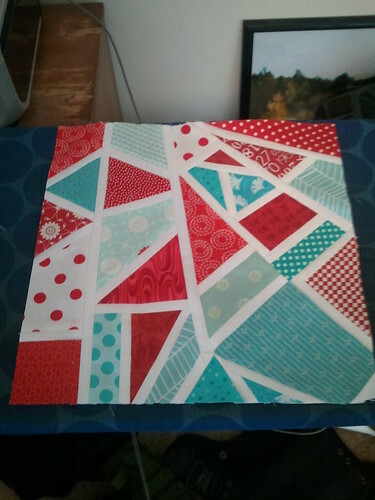 I want wonky log cabin piecing, but I stopped there because I wasn't feeling it that night. 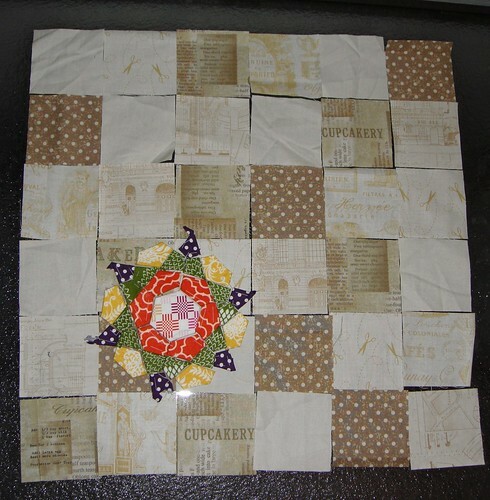 Then there's that piece of patchwork that you can barely see in the picture...a 20" square of cream-colored patchwork that will make up the base of my EPP rose star pillow for the PTS9. 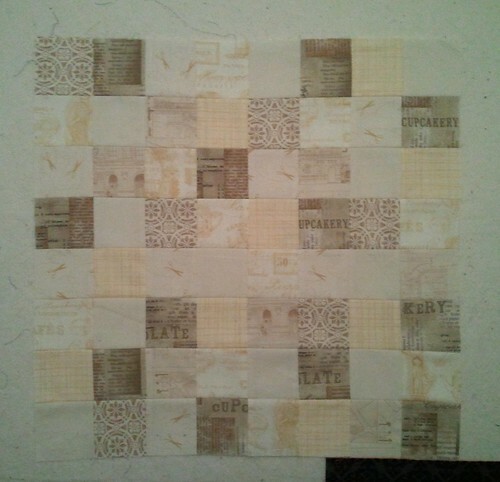 I actually started out with the set of squares on the bottom, but everyone on Flickr decided that the taupe dots were too dark, so I swapped them for some Farm Fresh crosshatch and some California Girl medallions. Except that the majority of people have been hating on the cream, big time. So sad. Because I've been second-guessing myself at every turn on the PTS design, I decided to make up another pillow in something that I loved, on the off chance that my partner might also love it. So I have 2 blocks out of 9 made up for that [and I do love it! a lot!]. Plus I fiiiinally was able to mail out my bee block for August [ew, I'm a bad bee mate]! 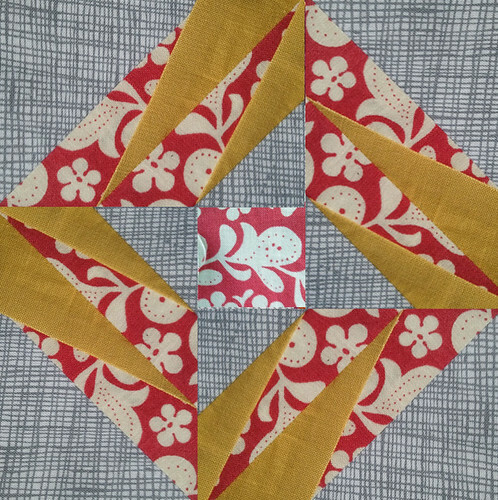 *Linked with WIP Wednesday at Freshly Pieced! I'm pretty sure that if you make something you love, your partner will too ! I also love what you started (in case your partner doesn't like what you're currently working on) ! I like the colors a lot. Congratulations for finishing that pillow :) It's always nice to cross things off of our never ending lists !! I really like the cream squares! 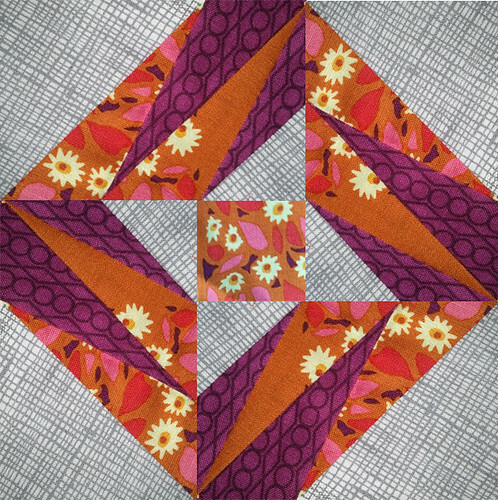 After reading so many modern quilt blogs, the low volume really catches the eye, oddly enough. :) The medallion fabric in that is really lovely. Wow, the two choices for your partner are so different. Both are lovely, just different styles!